Win a D&D Red Box Starter Set! The random.org selected winner based on the number of comments & twitter entries is: Tim Arthur! Congratulations, and watch out for more giveaways from newbiedm.com and Gator Games! So I got my hands on a shiny new Red Box, and now you can too, courtesy of the always awesome and fantastic folks at Gator Games! My review will be coming later this week, and you can win one of these beautiful, nostalgia filled boxes by leaving a comment below, or by following us on twitter and sending us a tweet telling us it’s for the contest. I’m expecting this to be our biggest giveaway yet, and it wouldn’t be possible without the great and wonderful folks at Gator Games. So do yourself a favor, visit their online store and check them out. Seriously, check them out. They truly make all these contests possible. This giveaway for the D&D Red Box Starter Set will run until Saturday night September 4th, at 11:59pm eastern/8:59 pacific. Gator Games is an FLGS (Friendly Local Gaming Store) operating in San Mateo, CA., and if you are in the area then do yourself a favor and make them your gaming store. But if you are not, it doesn’t matter, because Gator Games has a website with a great “Used Items” online store that is certain to satisfy all of your hobby needs with some really great deals. Go there now and enter coupon code “Holiday” at checkout for a 20% discount on your orders. Guys, I’m counting on you all to keep these giveaways coming, show Gator Games that NewbieDM.com readers are the most appreciative readers out there! So there you go… leave a comment below, follow us on twitter and send us a tweet, and win a red box. It’s very easy, so what are you waiting for? Absolutely count me in for this. Fingers crossed! Throwing my hat in on this one, sir. I’m definitely throwing my hat in. Please place my name on the list to win this. This would be an awesome item to win and share with my boys. Big Money, Big Money!!! No Whammies!!! Err not me then because I don’t live in the USA! Look forward to the review anyways. I’m feeling good about this one! I think it is my turn to win! It would be cool to win. While I am intending yo pick up the Rule Compendium, I would like to throw my name in here. I’m in! Be a great Christmas present for the kiddies! I would like to be in it to win it! I have yet to jump into 4E so this would be the gateway for me. 🙂 Thanks for the contest NewbieDM and Gator Games! Oooh! This would be awesome to win! Thanks for the opportunity. Count me in on some of that crunchy action. So, I comment on here AND on Twitter? Man, this is getting complicated. I too would like to be a winner…please! Much obliged for the inclusion, thank you. I’ve only been playing D&D for a little over a year, but I’d love this item to develop a sense of nostalgia for the years before I began to play this great game. Nice. I’m also looking forward to seeing the Essentials DM Kit when that comes out. Love to see the red box coming back, I’m in! Can’t wait for updated monster math! I adventure through life with hopes and dreams. The Red box is one such dream. I’m in for the contest. Will maybe be able to run a game for family if I ever win, buy, borrow, or otherwise procure this product. Thanks again for doing these. Good luck to everyone! Great blog, great giveaways. Count me in! Woo! I’d take this to board game night. I, too, would like to win. I love these! Another great one from two of my favorite twitter peeps! Interesting give-away. I’d be happy to win this, then again… I’d be happy to ‘win’ anything that has shown up on this blog. I follow your twitter feed regardless of any contests, but am not above begging for some swag. I would enjoy winning this thank you for the opportunity. Damn, 60 comments already! So Im tossing my hat into the mix even though I have one of these on pre-order and its paid for but Im trying anways. Seriously, Dude! Me, Me, Me! 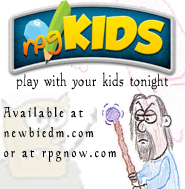 I’m hoping to get my kids playing D&D by the end of the year. This starter set may be a good way to introduce them to it. Same here regarding the kids – I’m thinking this is a good birthday present for the 9-year old. Or is it for the 40-year old?! I’d like to check this out, count me in! Thanks for the all the help for a new dm! And the contest! Awesome. I think I’m gonna love essentials. I would love a copy of the Red Box! I will create a battle between the new box and my original copy. Sweet another contest from my favorite Newbie! That means I’m in. I’d love a Red Box! You’re awesome NEwbieDM! Ooh! I’d like a Red Box! I’d love to win one of these items, thank you for running the contest. Love the site, been a daily ready for a while now. Enter me in the contest, I would love the red box! Thanks! You know, this sounds like fun! I will have to give the game a serious try if I win. Thanks for having the contest. This is awesome. Thank you so much for all the stuff youre doing. If so count this as an entry please! Thanks for letting us know about the half-price SW minis at Target. Since I’ll be spending all my money there, I could really stand to win this red box (which I will give to my eight-year-old, who already loves D&D but doesn’t have any of his own yet). I don’t particularly need this set, but I know someone to whom I’d love to give this to kick-start their D&D experience! Back to my past and some very fun times! Count me in. *GLEE* I could put it next to the original Red Box! Cool. I never owned the original Red Box (I had the Basic D&D boxed sets BEFORE the original Red Box, though), but it would be very cool to own one of these. I’m definitely interested in the Red Box. Cool contest! Id like to take this opportunity to thank Gator Games, I havnt won yet but hope to someday! I’m UTSquishy, and I Approve this contest. I humbly submit my entry for this noble contest. Oooooo now that would be interesting to introduce my players too, I’d love to win this contest. Submitting, already following on Twitter. Always enter for these. This one is good. Good luck, me! Yeah! I’d love to get my hands on that. If I don’t win it, it’s on my (ever growing) list of things to purchase. That red box cover is what initially attracted me to the game back when I was 10 years old. Had the cover been less awesome, I probably would have never picked it out of the book catalog and waited the 6-8 weeks for shipping. Had that not happened…well… life would be different than it is today since I met my wife through some RPG buddies. Hear that? A butterfly just flapped its wings again. I would love to win this! Brings back great memories! Count me in. Sounds awesome! Will probably pick this up as an introduction to my son & nephews, but I wouldn’t argue with a freebie. This would be an amazing win for anyone!! I could use a redbox! Oooh, oooh, oooh, I’d love the opportunity to get one in my greasy little hands! Need one for the nephews. 🙂 I’ll roll the dice. Oh man! I’d love to get this! I’ve got a few friends I’d love to give it to and continue the spreading of the D&D virus! It does seem a perfect way to augment my scant miniatures collection. Okay fine, I’m in! What a response already! Thanks for doing this contest. it already looks to be the biggest contest by the number of posts! Sign me up. This would be perfect to get my wife involved. She has had a passing intrest in my ongoing campaign but finds the rules too complicated. I’d love to get this to play with her. What isn’t to love about a boxed set? Count me in! Have wanted to get one of these to introduce DnD to my 7-year old. In the words of invader Zim, “Not yours! Mine!” . . . or at least so I hope! Nostalgia filled boxes doesn’t even start to explain. I’m starting something with new players. It’d be nice to have. Sure, I’ll enter. Where do I sign? This would be too cool! This set would be a great gift to get my kids involved in D&D! Oooh, I like free stuff! boy howdy! I would love to win! Gotta try. Box is very nostalgic. Go Newbie! You’re the best! 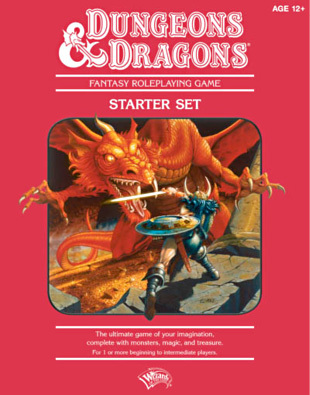 Just found out today that my 15 yr old son is interested in learning to play D&D so this would be a great gift to him if I could teach him 4ed from the ‘Red Box’. Here’s my entry. Thanks Gator Games! Roll my number! Thanks for a great blog and teaching me new tricks and tips. Always love the contests, even if I haven’t managed to win one yet! Hey Enrique! Sign me up! Hey, thanks for the website. I have used many of your tips in my game. It would be fantastical to win! I started gaming on the original red box, seeing that brings back memories! I’m super pumped to hear about what your opinion is of the new boxed sets. I’m not new to D&D but I am a new DM and I love your podcasts and site. I’ve used your excellent idea for markers and maps. Thanks and keep up the great work. Sure would like to win. I loved the old red box back in the day. Sign me up, thanks for doing the contest. I’m in, and I’d love to win. Great Blog Newbie! Would love to Join the contest! Love the blog. Sign me up for the contest! I would like to win the Red Box please. I would love the new Red Box to go with my old one. Better odds than playing the lotto. Keep up the great work and nice giveaways! Please enter me. And thank you kindly. I would love to win this beautiful Red Box. this sounds like a lot of fun. i actually want to run through the solo adventure three times, once for me, once for my daughter, and once with my fiancee, to get all geared up for the next season of Encounters. I would LOVE to win this Red Box set. I’m in it to win it! Man, this thing brings back memories. I’d love to win a Red Box set! please please please pick me! I wants it, my preciousssss. Shinies. Hi there, heard you on the Dungeon Master Guys podcast and liked what you had to say. Also like your solo podcast. Lots of interesting things. I would like to be included in the contest that you are running and I hope you continue doing what you are doing. Consider me entered. Enjoy the blog and appreciate the work you do. I normally just troll, but you managed to get me to comment…quite the achievement. Random pick or sob story. this is a great item for new and old player. I have no intent on paying for a copy of the red box, but if you’re going to give one away for free… I suspect that winning could actually be hazardous to my wallet since it will likely get me hooked on D&D Essentials. Sounds great- thanks for the contest! Doin’ the red box dance…doin’ the red box dance! Looks awesome, I’m hoping this will be just the thing to get my Young Nephew into Gaming. My son keeps asking about D&D and this would be a great way to start! Do want. If only to see what it’s like. I would love a free red box set. @JesterOC on twitter. I’ll throw my lot in for this one, absolutely. Me please! I would love to review this from the Old School perspective, to see if it can serve as a ‘bridge’ between the ‘classic’ and ‘later edition’ worlds. Yes please give me chance to get 4E back on the table. The Red Box looks awesome, enter me. I would like to enter this contest too. Thanks. I realize I have no shot at winning, but why not? I’ve got little kids counting on me winning this- thanks! The Red & Blue boxes were my first introduction into the world of rpgs. Unfortunately about 8 moves and 20 years later, I no longer have any of my rpg materials, except of course my dice. Who could ever misplace those? I’d love to get my hands on this again and get my new groups of friends into the rpg scene. Thanks for offering up such a sweet price. Keep up the great work. Another great giveaway. Sign me up! A great promotion, I hope I win. I’d come to okay with you here. Which is not something I usually do! I love reading a post that will make people think. Also, thanks for allowing me to speak my mind!